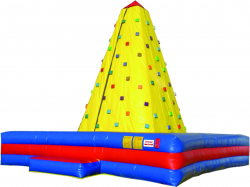 The 26 Foot Climbing Mountain will be the thrill of your next event. Challenge your strength and abilities by climbing to the top of the mountain. Adults and children 36 inches and higher may use this inflatable. The Climbing Wall comes with harnesses for four participants at a time to ensure public safety.